Like 2001's "Black Hawk Down," which frustratingly did not include any mention of that horrendous debacle's most shocking and politically devastating incident, "13 Hours: The Secret Soldiers of Benghazi" likewise ignores the political fallout of that later fiasco that continues to make it newsworthy today. The result is a high-firepower shoot-'em-up that sacrifices any meaningful historical context in favor of generic "mavericks against middle managers" military madness. In the case of "Black Hawk Down," director Ridley Scott somehow left out the infamous and outrage-inspiring image of the dead American soldier who was dragged through the streets of Mogadishu amid cheering crowds. Similarly, "13 Hours" includes only an offhand reference to news reports linking the September 11, 2012 attack on the US ambassador's Benghazi compound to protests about an anti-Islamic video, without revealing that this actually was a lie spread by then-Secretary of State Hillary Clinton and the Obama administration. The closest the movie gets to addressing the issue is when someone points out, "We didn't see any protests." In other words, "13 Hours" isn't going to satisfy anyone who hoped it would help derail Clinton's campaign for the presidency by dramatizing her dishonesty. Because the movie ends on the morning after the carnage, there are no references to later congressional investigations of Clinton publicly blaming a YouTube video and those non-existent protests while she was sending private e-mails in which she acknowledged that the attack was a targeted act of terrorism. What we are left with, then, is a brothers-in-arms exercise that goes from a risky rescue mission to a modern-day Alamo standoff, in videogame-violent Michael Bay-directed fashion. After heavily armed terrorists invade the US ambassador's compound, a half-dozen rowdy CIA security team members buck the authority of their stereotypically bureaucratic station chief (the hiss-worthy David Costabile) by gunning up after they are told to stand down. When they return that night to what's supposed to be the CIA's secret annex and come under attack there as well, their calls for US military help go ignored for so long that, as one character puts it in classic Bay-speak, "This sh*t's startin' to get real." James Badge Dale is good as senior security operative Tyrone "Rone" Woods, whose manly take-charge impatience with protocol eventually leads him to snarl at his superior, "You aren't giving orders anymore, you're takin' 'em! You're in my world now!" Pablo Schreiber is the never-scared-in-a-firefight Kris "Tanto" Paronto. David Denman is bearded Garth Hudson lookalike Dave "Boon" Benton, the kind of placid warrior who reads Joseph Campbell's "The Power of Myth" during his downtime. 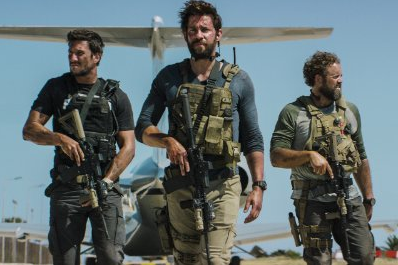 The cast's weak link is John Krasinski as former Navy SEAL Jack Silva, newly arrived in Benghazi to join the CIA security team. Even bearded, bloodied and brandishing various firearms, the former star of the US version of the sitcom "The Office" just doesn't cut it as a tough guy. Also not helping are laughably cornball scenes in which he long-distance video-chats with his ridiculously adorable young daughters and his ditzy, newly preggers wife, who says things like, "The girls don't need a treehouse, Jack, they need you!" She later casually notes that hubbie's life insurance bill hasn't been paid. Good God, lady, do you know what he does for a living? The action scenes are intense if sometimes geographically hard to follow (even when maps are provided). The attackers who approach the CIA annex through an area nicknamed Zombieland are as fittingly terrifying as the relentless walkers in "The Walking Dead." And in case a loudspeakered call to prayer isn't already enough to make Western audiences feel a sense of fearful dread, Bay helpfully puts plenty of rifles in the same shot with Muslim men kneeling on prayer rugs. As one character notes, "They're all bad guys, until they're not." The screenplay by Chuck Hogan (based on the book by Mitchell Zuckoff) employs some dramatic license, but is sufficiently credible. It's also strenuously apolitical, laying the blame more on institutional incompetence than on anyone specific. That's too bad. The perfect trust-no-one epilog should have been the real-life footage of Clinton, caught in her lie about the cause of the deadly Benghazi attack, defensively telling a 2013 Senate committee, "What difference, at this point, does it make?"